Do you know Kate & Rose sewing and embroidery patterns? As part of Sewing Indie Month, independent designers are interviewing each other, and one of the things I love about this project is the opportunity to discover new-to-me pattern companies. Kate & Rose is one of them. I love this Giselle dress pattern (above) - so gorgeous! 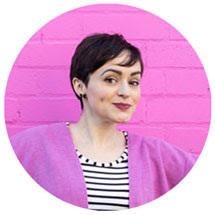 - and really enjoyed getting to know designer Kati in this interview. I know you will too! Hi Kati! It's lovely to meet you. Can you tell Tilly and the Buttons readers a little bit about Kate & Rose? 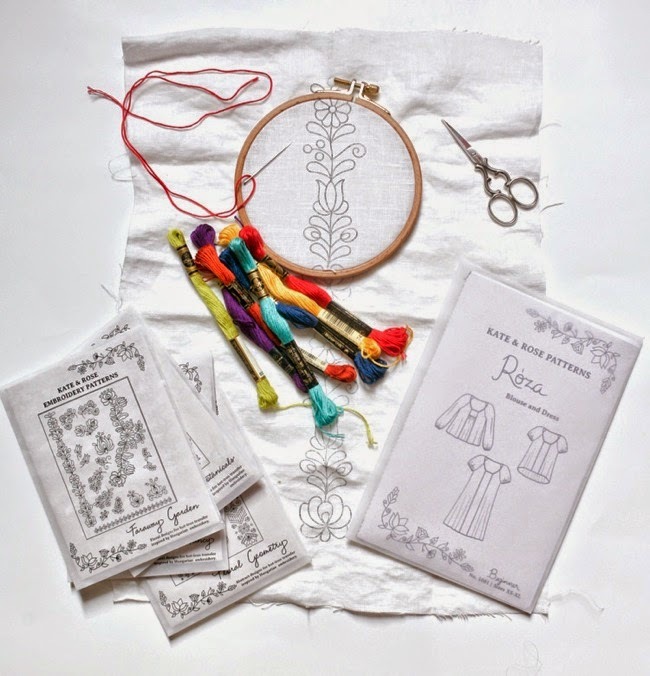 "Kate & Rose is a line of sewing and embroidery patterns, often inspired by folkwear. I design for women who like to make easy-going pieces with an interesting detail or two, but perhaps don't have a whole lot of time to devote to making one garment. You can place embroidery on all of my designs, or use the embroidery patterns to add a folklore-inspired touch to anything else you like." Where did your interest in folklore-inspired designs spring from? 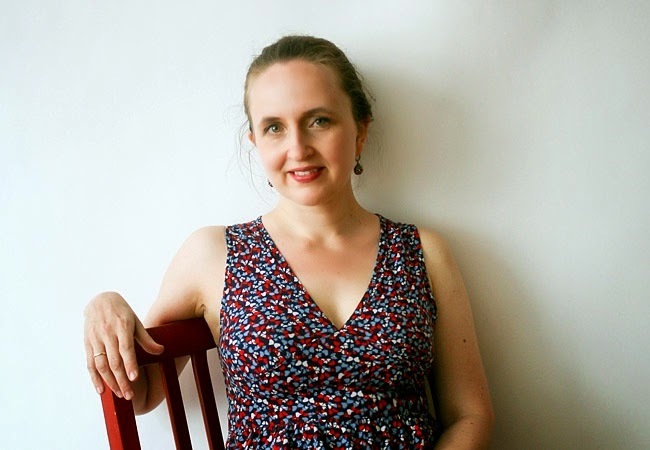 "While growing up in Hungary, folk dance and basic hand embroidery was part of my elementary school's curriculum. I'm also a child of the '70s, when flowers and bright colors and hippies and folkwear worn in daily life abounded. I think that aesthetic is forever etched in my brain (or - some might say it has forever scarred my brain…). But it's also something a bit more idealistic. In small Eastern European villages women often came together to make things - finish a girl's trousseau, spin yarn, or paint the walls of their houses with wildly colorful flowers. Folklore is a bit about that: making and creating together, and in the process making a tough world look a little bit nicer. I try to infuse my designs with this sense of coming together to create. Eastern Europe is a very divided and troubled, and of course I'm not suggesting that pretty embroidered blouses can heal the world's divisions. But making things together perhaps does improve things, just a little. The modern sewing movement is a kind of folklore too: it's about coming together and making things, with the help of the internet. It's an amazingly supportive and kind community." That's such an interesting way of describing the online sewing community - I agree completely, collaborative creation can indeed make the world a better place. Tell us, how did you get started with your pattern business? "I was at a modern quilters' meeting a few years ago (I used to make quilts - I no longer have time, except to make doll quilts for my daughters! ), and Kathy Miller, one of the founders of the fabric company Michael Miller was there to speak to the group. She talked about leaving her fashion industry job to start a creative business, at first working out of a New York City apartment with her business partner, Michael Steiner. She talked about the sewing-making-quilting community for which she was now making fabrics: how amazed she was that the focus was on creativity rather than winning at any cost, which is much different than what she was used to before. When I heard her speak, I had two very small children at home. A few years earlier I'd left behind a career in academia (I have a Ph.D.) because it was really quite impossible to get a full-time job in my field. Impossible without moving really far away from my family that is (I live in New York), and even then quite tough! I always wanted children and wasn't so young when I had them, and my family life was really important to me, so I gave up any dream of being a university professor. I was happy with my new life but in another way, it was a big blow to my sense of self. For years I didn't even think about starting any other career. But then, little by little, I started sewing again. I'd sewn a lot of my own clothes when I was a teenager, it was tough to get clothes you actually liked in Hungary back then). And then, hearing Kathy Miller talk about how she took a chance on a creative business made me think, wait, so people actually do that WITH SEWING? So I decided I wouldn't let myself find excuses and go make sewing and folklore and handwork my work and career. No matter how many mistakes I make, how little sleep I get, or how silly I'll look in the process. My husband warned me it would be hard - he's a photographer and knows pretty well how much work it takes to be a creative professional! - but he is also an amazingly supportive person. It took me a long time to figure out just what I want my work to be about. I dabbled in RTW for about 15 seconds but realized I love tinkering far too much. And also, makers are so much nicer! So here I am, making embroidery and sewing patterns…"
Good on you, Kati. You're right, it takes an insane amount of work to start and run your own business, but you only live once, so if you have a dream, you should go for it! And yes, makers are seriously lovely - I can't get over the sweet emails that my customers send me, I'm pretty sure they're the nicest people in the world! 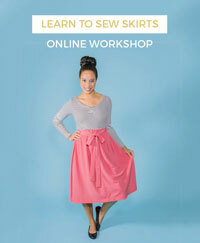 Now - talk us through your approach to designing sewing and embroidery patterns. Are there any similarities in the processes? "The processes are similar in that coming up with a design always starts with an image that gets stuck in my head. Then I go collect every possible variation I can find of that image, online via Pinterest or elsewhere, and offline in vintage stores, flea markets, magazines, vintage sewing patterns. Eventually I start to draw ideas they bring to mind. I usually draw in the computer and not by hand. I'm not a very linear person so being able to think/draw things out in a non-linear fashion, by computer, without having to start from scratch over and over again, is closer to the way my mind works. For sewing patterns I do usually start with a paper draft which I then digitize to finish working with. Having said that, I do try to keep a handmade feel to my patterns anyway because it's a reflection of my aesthetic better. So… I do think creating patterns for sewing or embroidery are very similar." What are your own favourite things to sew? "Well… I think my Instagram feed reveals how many blouses I own… I'm afraid I'm a somewhat boring seamstress when it comes to sewing for myself." Not boring at all - it's good to have a signature style! My readers love dressmaking but not all of them are into embroidery... yet! Do you have any top tips for getting started with embroidery? "Make something real and useful that you might like handling a lot when it's done. Something that will recall to you the time you spent stitching it. For me, this is clothing: it touches our bodies every day. And I like the way hand-embroidery reminds me that living people's living hands made the clothes I'm wearing, even if I didn't make it myself. Start with a simple pattern, and use a color (or colors) of thread that makes you happy when you look at it. 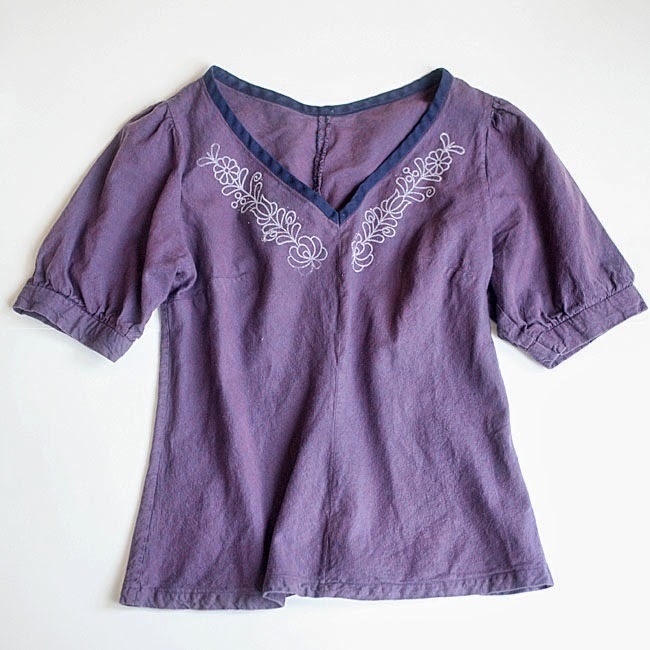 At first, use something easy to stitch with, like perle cotton, #8 or #5, nothing too thin. A nice thing to do is trace a pattern with just a running stitch, like Sashiko, using variegated thread. Not hard at all yet the effect is quite impressive. Oh, and make a date with a friend or two and stitch together!" Great tips, thank you. I love embroidery and started a project to embroider pattern illustrations but haven't done it in ages - you've inspired me to get back into it this summer! Important question time - what is your staple meal, please? ie. what is the meal you eat most often, by default? "This is a really important question! Food is a huge part of our daily lives and the quality and flavor of what we eat affects everything else. Having said that, there's more often than not too little time to make fancy meals. I have a rotating crew of staples, they all involve some degree of chopping vegetables and throwing them in a pot, quick meals that can be made with whatever is in the fridge. One is a stew, slow-cooked on days when I spend the afternoon at home working (I add chicken, sausage, or smoked ham to vegetables, and simmer them with beans or chick peas), there's a soup (my kids call it "green soup" and oddly enough, they actually eat it) I make it with leeks and cucumbers or zucchini, blend it with a stick blender, also blending in fresh herbs like dill or more recently mint. Then there's the light pasta dish when I literally have 15 minutes to cook and need to eat something warm and fresh - sautee onions and a chopped veggies in olive oil or (ahem) bacon grease left over from making bacon earlier, perhaps add chicken or a bit of tuna, and eat with pasta. But - let's be honest - another important staple is sushi ordered from the Japanese restaurant down the street." You're making me hungry! Back to business - what plans and dreams do you have for Kate & Rose in the future? "Right now I'd like to get through the next two months, before I get a longish vacation… I've already got another pattern in the works, and there's more embroidery to do! I'd like to grow Kate & Rose as a brand of patterns for folksy stitching. 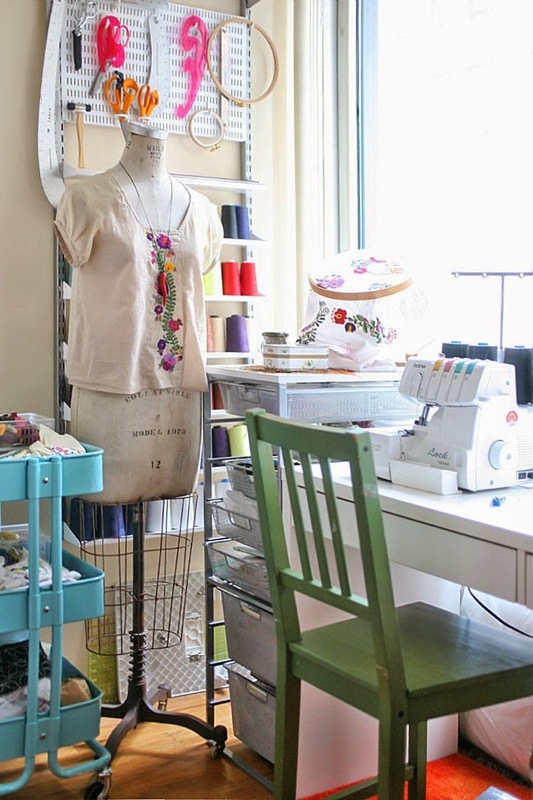 And do all the things people dream of - collaborate with other makers, write a book or two perhaps, and of course meet more of the wonderful makers of the sewing community along the way!" Good luck, Kati - I'll be rooting for you!